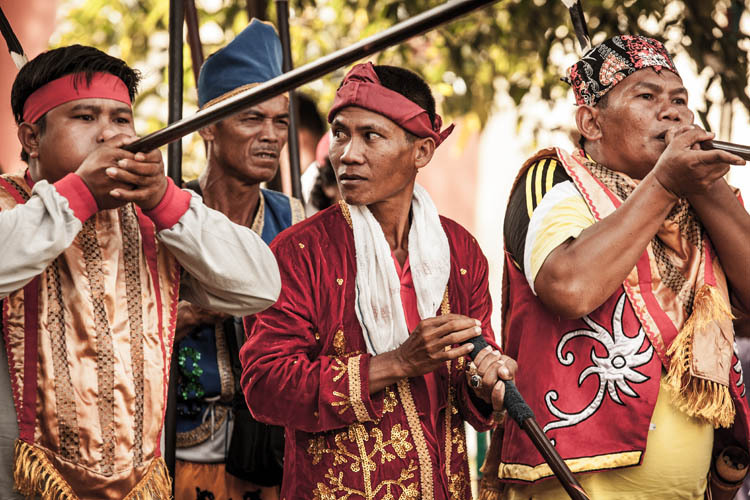 A while back I wrote about the wonderful parade that kicks off Central Kalimantan’s week-long Dayak cultural festival, known as Isen Mulang (“Never give up” in the Dayak Ngaju language). 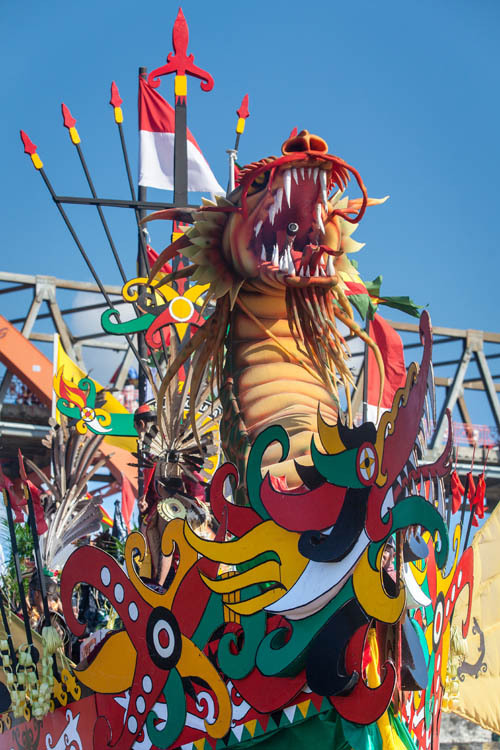 But, grand though it is, there is a lot more to Isen Mulang than just the opening parade. And much of Isen Mulang is quite unique. 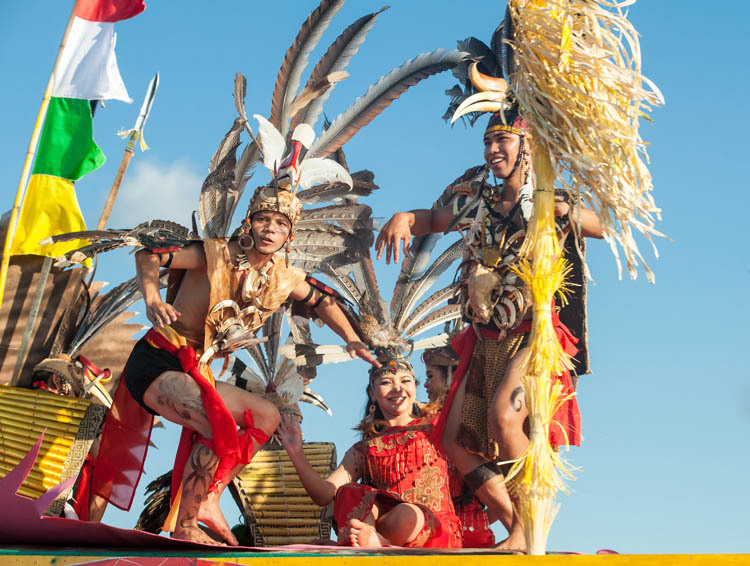 Many of the events take the form of competitions between the 13 Kabupaten (districts) plus one Kota (city i.e. 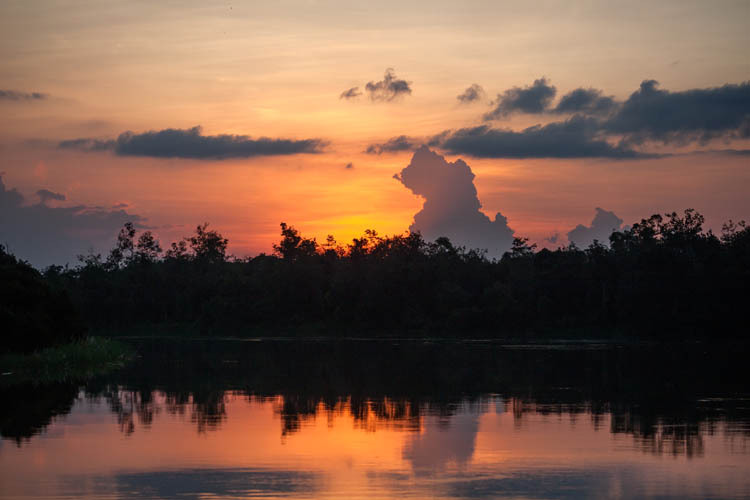 Palangkaraya) that make up the province of Central Kalimantan (Kalimantan Tengah, usually referred to as KalTeng). There are music and dance performances (traditional and contemporary), presentations of produce and cooking, and a number of ‘sporting’ events – but unlike the sports that we are accustomed to. For example, there is football – but played at night-time, barefoot, with a flaming coconut for a football (sepak sawut). There is a fishing contest, where the (female) competitors stand waist-deep in a small muddy dam and catch the fish – with their bare hands (mangaruhi). And there is target shooting – with blow-pipes (sumpitan, or sepit). 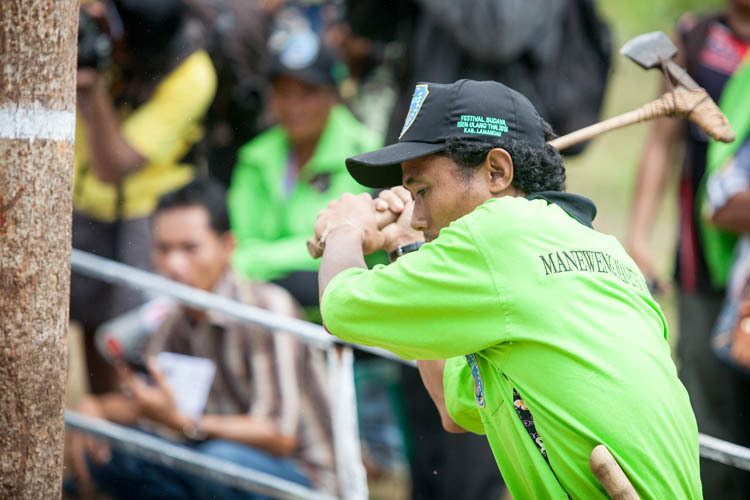 Hunting with the traditional blowpipe, with poison-tipped bamboo darts, used to be the preferred method for stalking game in the forests of Kalimantan. It is a stealthy and remarkably effective way to hunt, and those little darts can easily be propelled tens of metres (even reputedly up to 200 metres), with surprising accuracy. But rifles (often home-made) are pretty good for hunting too. So nowadays the blowpipe is (mostly) employed for sport, shooting at archery targets rather than at deer, birds, pigs – or enemies. The pipes are around 2 metres long, and very straight. Ideally they are made from kayu ulin (ironwood), but other timbers are also used. There’s a narrow (about 0.5cm) barrel running the length of the pipe. Each competitor has five darts, each about 20cm long, with a sharpened point at front end, and a little cone (to catch the ‘blow’) attached to at the tail end. With the dart inserted and your lungs full, you hold the pipe as steady as you can, slowly lowering the tip till the target lines up, and then… blow. You don’t even need to blow particularly hard to propel the dart with considerable speed. 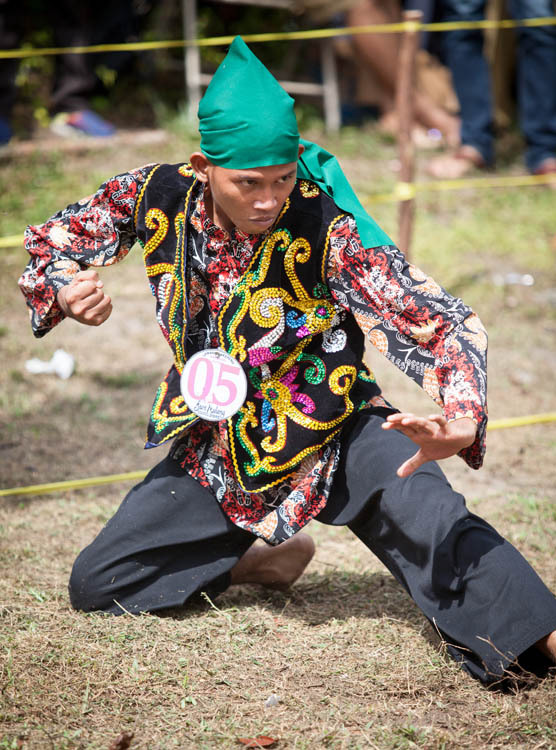 Each district team of competitors was decked out in traditional clothing of their area – though sometimes traditions were re-interpreted a bit… There were vests made of bark, satin, velvet, cotton; elaborately beaded garments, and lots of the swirling amoeba-star shapes that are amongst the most common of Dayak motifs. Finished off, in most cases, with running shoes (this is after all a sporting event). There were simultaneous competitions for men and women, with the women’s targets 10 metres from the firing line, and the men’s targets five metres more distant. As the only foreigners in attendance, we got a lot of attention, and got some private coaching and practice in between the rounds of the competition. 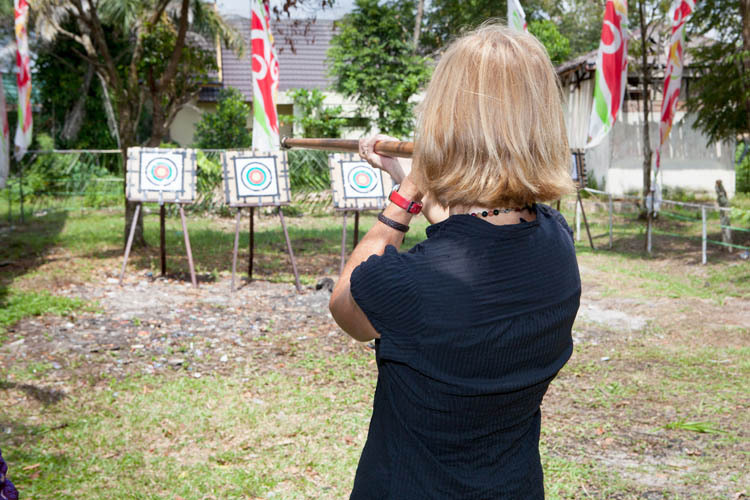 We managed to hit the target each time – and Karen scored better than me! It was fun… but you must always remember to take the deep breath BEFORE putting the loaded blowpipe up to your mouth. 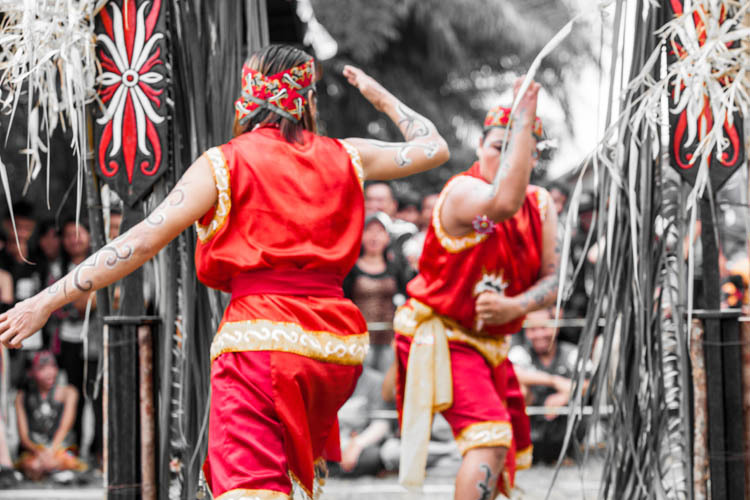 The Lawang Sakepang is a stylised dance/fight between two ‘warriors’. They stand on either side of an archway, with magical strings suspended across the arch, adorned with flowers. They ‘fight’ without ever actually coming into contact with each other, mirroring each other’s movements, and the bout is complete when the string between them is broken, and they swap sides of the barrier. In times past, the ritual of Lawang Sakepang was performed whenever a visitor sought entry to another village. He or she would have to prove their martial prowess before being admitted. 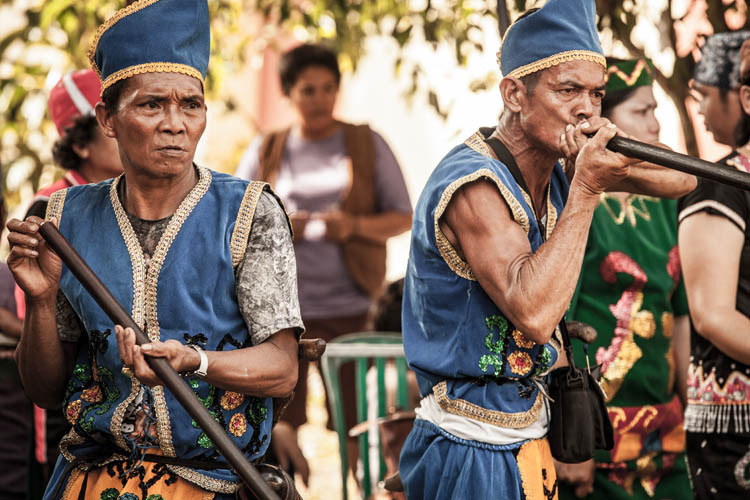 Now it is performed as a competitive event between two-person teams, but we have also seen it performed when the groom arrived at the beginning of a Dayak Ngaju wedding ceremony in Palangkaraya. The teams were clearly well trained, and their moves were thoroughly choreographed, because they were perfectly synchronised across the barrier that separated them. The audience gave them rapt attention, and loudly gasped and cheered whenever a particularly impressive move was made. 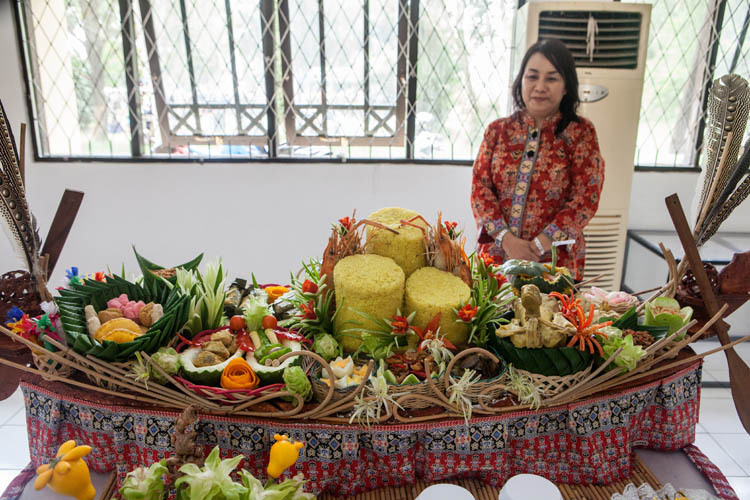 From combat to the kitchen: one of the buildings at the Museum Balanga (where Karen works) was given over to displays of produce and food preparation, featuring local ingredients and favourite foods of the Dayaks – from the forests, the rivers and the home gardens. All was presented in elaborate displays which reminded us – although the actual ingredients were rather different – of displays and competitions at the Royal Easter Show in Sydney. Clipboard-wielding judges roamed around the hall, taking notes and asking questions of the chefs and ‘food stylists’ (all of whom were female). 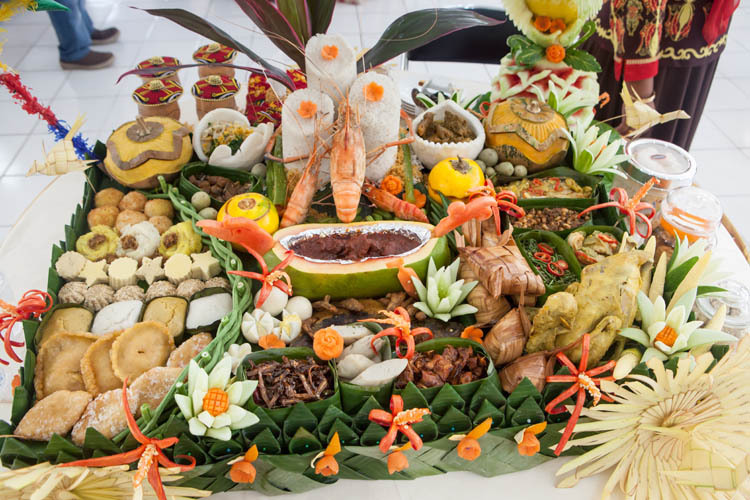 We didn’t stay till the end of judging, so we don’t know the result, but I rather hope that the food-filled longboat above won first prize for its creativity. Also a bit reminiscent of an agricultural show in Australia was the wood-chopping competition (maneweng). 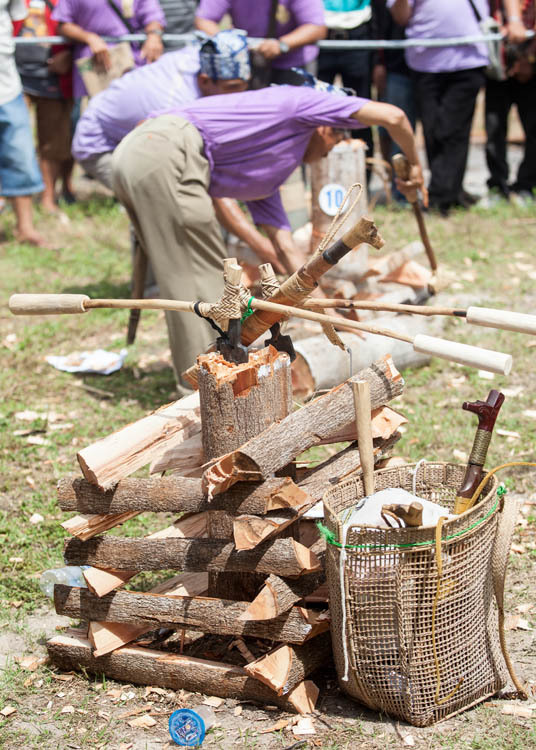 But the axemen had to use traditional handmade axes, which slowed them down considerably. But the spectators were there in droves (whatever ‘droves’ are) later that day down by the Kahayan River. For a couple of kilometres, on both sides of the river, it was standing room only. We had the best vantage point, being guests (in fact the only guests!) 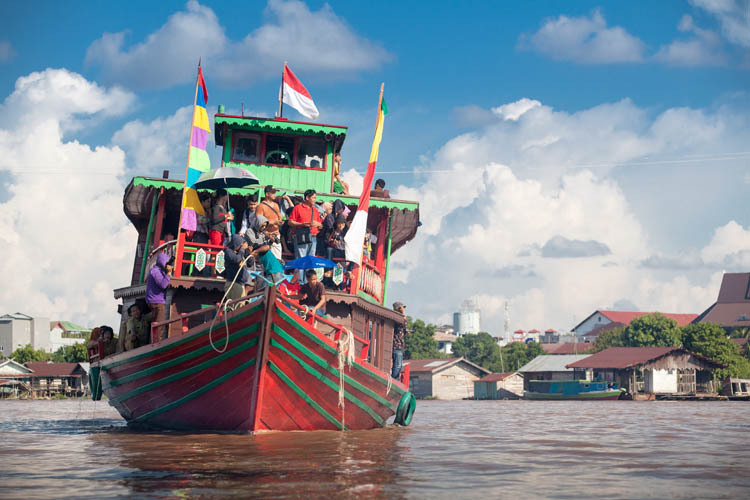 on a luxury river cruiser (the Rahai’i Pangun). At first the river was quiet, just its usual muddy self, with the occasional klotok (canoe) passing by. The fellow at the front of the klotok in the photo above is Putu, our friend and river guide. The Kahayan River bridge in the background is the only crossing for several hours travel upstream or downstream, and locals are very proud of it. 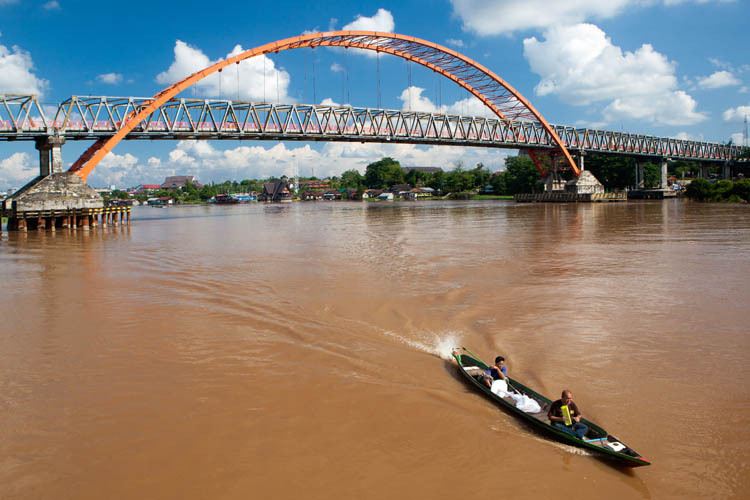 The bridge, opened in 2002 by then-President Megawati Soekarnoputri, seems to feature in just about every tourism photograph of Palangkaraya. 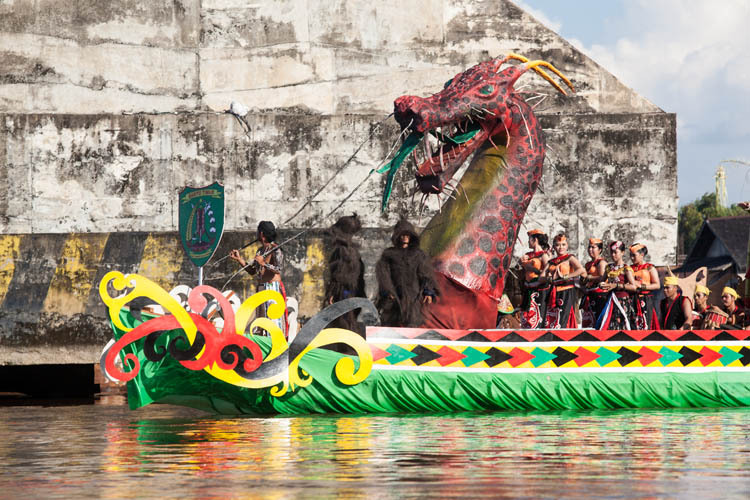 And then, from under the bridge, they started to appear: Dragon Boats! 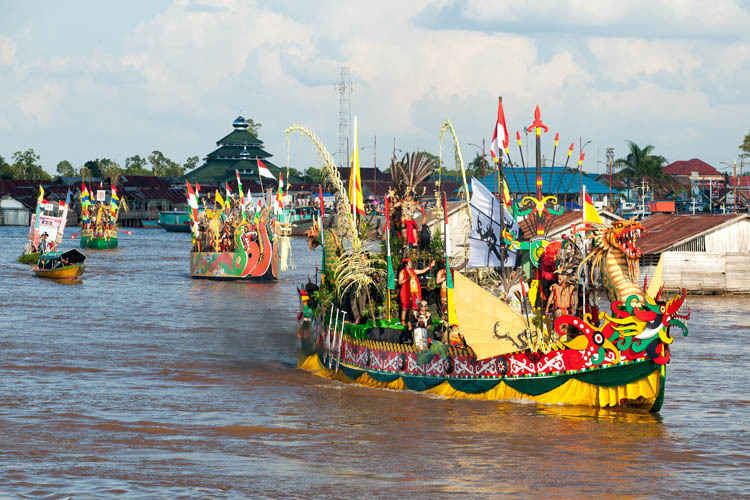 The boats (actually known as jukung hias, or ‘ornamental boats’) are in competition too, with prizes for the best decorated boat, and for the boat with the best traditional costume, music and dance performances on board. 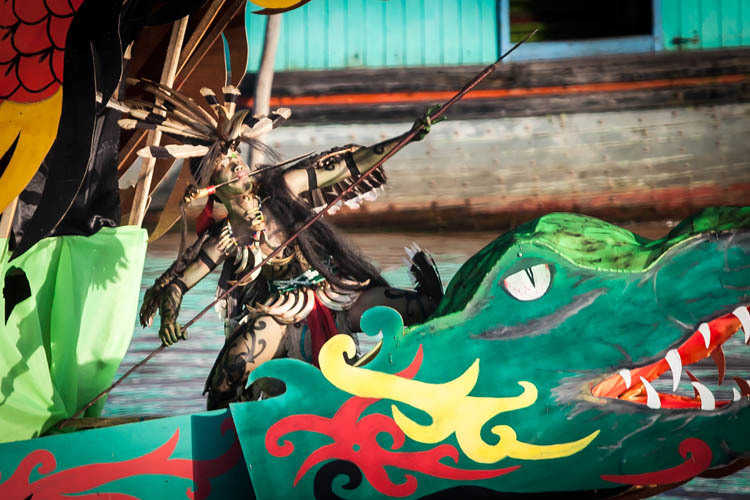 One by one they arrived and joined the procession on the river, each boat with its own complement of costumed crew. As the dragon boats passed by, other vessels would lean over for a better look. It was quite a spectacle when they all assembled! On board each of the boats, dancers and musicians strutted, posed and danced to entertain the onlookers. They seemed to be enjoying the occasion as much as we were. Note the Dayak motifs in the leg tattoos above, the bark vests, wild boar tusks and Hornbill casques worn by the male warriors, and the enormously long feathers of the Great Argus pheasant. (And yes, it’s an endangered species). Some of the warriors looked quite fearsome. This fellow above made an excellent figurehead for his boat. Note the mandau (bush knife) clasped between his teeth, more (temporary) tattoos, and the Hornbill feathers in his headdress. 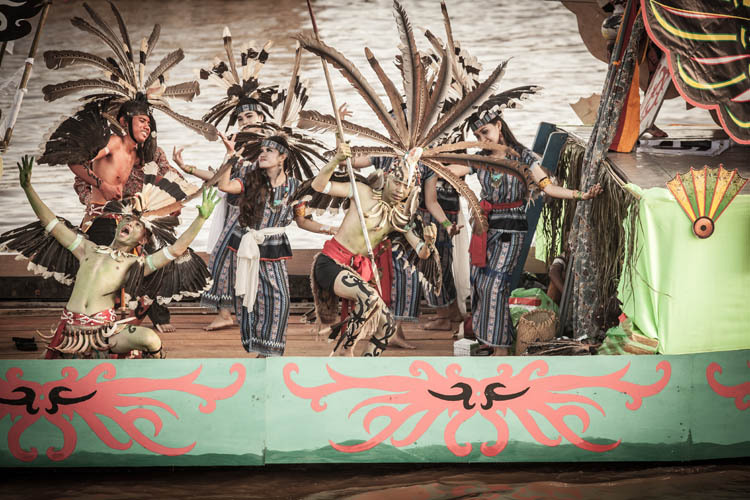 More photos from the Isen Mulang Festival can be viewed on my website. 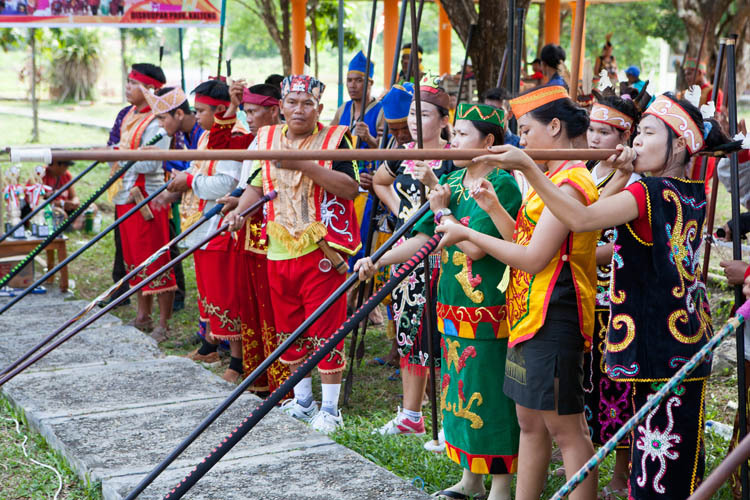 This entry was posted in Indonesia and tagged blowpipe, Central Kalimantan, dragon boats, Isen Mulang, jukung hias, Kalimantan Tengah, maneweng, Museum Balanga, Palangkaraya, sepit, sumpit, sumpitan. Bookmark the permalink.